It is entirely possible that when Walt Disney was overseeing the design of Disneyland, that he had no further thought as to the physical structure of the park other than it having a railroad around it. Indeed, this is one of the traditions which has been followed to the letter – whenever possible - by every generation of Imagineers, weather it be the oft repeated quote vis a vis the railroad or not. In a day and age when Walt Disney is deified beyond any possible comprehension and his most published quotes are treated like commandments from on high, even outside of the insular corporate structure of Disney, for the company to build a “Castle Park” without a railroad around it would possibly summon hordes of the faithful, heavily armed. Yet there are other important structures to the parks too, beyond even the railroad, the railroad berm, a castle and a Main Street. Although we will probably live to see a Disneyland-style park without a Main Street, Adventureland, or Tomorrowland, there is one structuring formula which I guarantee will outlive any mutations of the original template: the waterways. Water is such as essential, integral part of the Disney park experience, and smart design teams integrate water – weather it be placid or dynamic - in as many ways as possible in a park. Water, the basic element of life on earth, is bestowed with a magical capacity by human cultures, and it has appeared in a number of signifying forms through art and history. Water’s depth and relative impenetrability can make it into a dangerous area, and deep sea lifeforms fit the human description of grotesqueries. Water’s dynamic and healing nature transforms it into waterfalls and ponds, places of renewal and contemplation, which culturally wormed its’ way into the European pleasure gardens and thus, through conceptual diffusion, into Disneyland. Water, via its’ vastness and unclaimed nature, can be the setting for adventure and intrigue, and we have a deep-seated fascination with the ability of the Viking, the pirate, or the sailor to transverse these spaces. Or water can be a transitory space, usually into limbo or death: human cultures of all races have referred to death as being thematically linked to water, probably since before we came up with the idea of a River Styx. Weather this be by dint of its’ links to vastness and loneliness, its links to our desire for peace and solitude in death, or its’ poetic repetitions of water’s role in birth, this is undeniable. Humans inevitably are drawn to tales of codes and morals being stretched to their limit on bodies of water. It’s one of our basic cultural tropes. I want to cross over into campground. Disneyland’s use of waterways is really its’ most sophisticated unified technique of conveying otherworldliness. Although we may pass under a railroad train, that symbol of American progress and the country’s Manifest Destiny, we also pass over, under, and between waterways, which truly signal where the magical transformation of space begins. Although conceivably a holdover from a castle’s requirement to have a moat, we transverse bridges in order to enter the realms of Yesterday, Tomorrow and Fantasy. Those spaces not explicitly marked as passages over those magical waters are often designated as magical spaces through fountains, like those outside the Disneyland Tomorrowlands of 1955 and 1967. Once inside those realms of fantasy, the water begins to play a subtly different role: as signifiers content through cultural cues. The Enchanted Tiki Room devotes a long time to a magic fountain, and right next door the murky (color coded: dangerous) waters of the Jungle Cruise transport visitors into the attraction, using the water’s dual cultural contexts of adventure and the fantastic to immediately create a visual, cultural, implicit understanding of the rules of the attraction. The Swiss Family Treehouse’s mastery of water is signified through the iconic waterwheel, a sign that in this attraction, man has both harmonized with and conquered nature through ingenuity. Compare this to Schweitzer Falls of the Jungle Cruise, created by nature and located at the center of an untamed wilderness, one of the original Disneyland signifiers of danger. 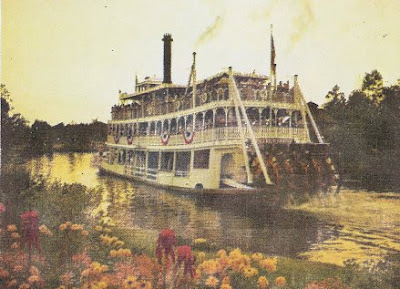 Fronteirland displaces its’ obvious and traditional symbol of the progress of the West - as the railroad has already been used at Main Street - and instead treats the river as a tamed beast by introducing a steamboat, a uniquely American invention similar to the railway engine. This is where Walt Disney’s intentions become somewhat more interesting: we know from the earliest drawings of his “Mickey Mouse Park” that a jungle river ride and a steamboat around an island were planned. This having been established, and taking into account the Tomorrowland lagoon and the submarine ride he finally built there, can Disneyland also be seen as a document of America’s mastery of water? Water voyages play into every original Disneyland land except Main Street and account for much of the park’s aesthetic cohesiveness. New Orleans Square, the most thematically unified thing Disney ever has and likely ever will build, uses a number of visual tropes both inside and outside its’ attractions to signify a beautiful but haunted atmosphere, and the pallor of the deathly mystery of the sea hangs over all. Pirates of the Caribbean inverts the conquest of the water seen by the Mark Twain, Submarine Voyage, Jungle Cruise, Swiss Family Treehouse, and just about every other attraction by making the open water something genuinely frightening and dangerous: immediately we are punished for traveling too far into the bayou by a seafaring specter and sent into a phantasmal realm of evidence of the sea’s conquest of man. Although the dead pirates may have been done in by a variety of factors, the sound of seagulls and surf leave little doubt that they are, in fact, in a watery grave. Even the Haunted Mansion, with little explicit reference to the sea, has a ghostly pallor of the ocean over it, with its’ schooner windvane, widow’s walk, and ghostly changing portrait. Although WDI doesn’t make an effort to cue us on this, in both location and architectural style, both Haunted Mansions make more sense if we don’t think of them as being on a river, but an ocean. WED, always conscious of visual tropes and how to exploit them, really did a masterful job of creating even further meaning through waterways in Florida. In order to reach the Magic Kingdom, spectators must first transverse a body of water, weather directly across or around the circumference. This is a much more meaningful exploitation of water than anything at Disneyland, as the act of going across water serves the double purpose of making the journey more picturesque, as well as saying, culturally, that by the time you’ve crossed the lake, you will be very far away from reality. By exploiting our cultural concerns with water, WED has set the stage for us to subtly but physically enter the dream state of The Magic Kingdom. This probably would’ve been enough, but WED doesn’t rest on its’ laurels and every land in Magic Kingdom has important ties to the water. Adventureland’s most significant visual trope, given the mix and match architecture, is of water, and the moat was not extended to go around the Swiss Family Treehouse for no reason. Adventureland has seven picturesque waterfalls, three on Jungle Cruise, three on Swiss Family Island, and one in front of the Tiki Room. The soothing, dynamic nature of these waterfalls is still one of Walt Disney World’s most beautiful things today, and when Caribbean Plaza was added in 1973, it brought along five of its’ own tile fountains, each carefully but discreetly tucked away and each given its’ own name. No other land in the park uses cascading water as a key aesthetic feature. Frontierland and Liberty Square brilliantly use the river as the key feature of the area, and as spectators follow the flow of the river, time passes and America pushes west. At the transition between Frontierland and Liberty Square, guests pass right over a key conceptual feature of this evolution: a small babbling brook which empties into the Rivers of America known as “The Little Mississippi”. Early guidemaps for The Magic Kingdom always included Frontierland and Liberty Square on the same page or logo to make explicit the link between the two as being a “meta-land” of American progress. This is why you can enter from the hub at Liberty Square, the start of the cycle, and not Frontierland. 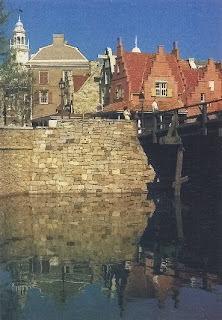 Fantasyland and Tomorrowland and even Main Street’s use of water is comparatively simple, although Main Street at least had the sense to exploit the picturesque quality of Magic Kingdom’s beautiful, vast and winding moat and plop Swan Boats on it for a time. Fantasyland’s Submarine Lagoon was once the transitory space on the far east of Fantasyland into Tomorrowland, its fanciful Victorian metal presaging futurism. The Lagoon was matched on the other side of Fantasyland by the Skyway pond and waterfall, but besides a few fountains placed too erratically to qualify as true key aesthetic features, Fantasyland was parched. So was Tomorrowland, although at least in the early days water would cascade down those sleek white spires and into the moat below. 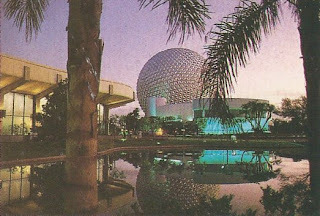 And water has retained its’ power, in EPCOT Center where great pools of water (originally) welcomed visitors to Communicore and Danny Kaye’s old opening day promotional film quip about feeling like Columbus upon seeing World Showcase points up a use of water both related to the Magic Kingdom’s Seven Seas Lagoon and thematically new and varied. Disneyland Paris and Animal Kingdom would make good use of waterways to break up land, and the dynamic use of water is one of the few saving graces in Disney’s California Adventure. Water and waterways, as symbols of power, enlightenment and leisure, from Japanese Koi ponds through European Monarchy’s fountains and ponds and moats, right up to Disney’s deployment of water and water fountains and pond and lakes at Walt Disney World (very few of the resorts, for example, fail to make use of some kind of body of water), water and waterways are some of the simplest, cheapest and most effective design tricks up Mickey’s sleeve. And unlike efforts to be hip and edgy, unlike efforts to build the future, and unlike efforts to chase after a market share, water is classically beautiful and water will always be effective. I was recently elated to obtain what you see to the left. You're not starting to hallucinate; it's an ordinary paper napkin. It has "Disney" printed above it and several rodents below it, and if you've been going to Walt Disney World for any length of time it is probably very familiar to you. I'm not so sure when they stopped using these, but I do have a wonderful memory about them. It was when I was younger, eating in the Dixie Landings food court one beautiful Florida morning before heading into The Magic Kingdom with my family. The memory's not too clear, but several months ago I saw a picture of the old plates which had the "multiple Mickeys" pattern and became very nostalgic because of that memory. So although twelve napkins may not be the most exciting thing in my small collection of Walt Disney World empheria, they are among the most appreciated. A handful of the really accomplished Disney attractions effectively "follow you home"; and although the Haunted Mansion is one of them, it is not by dint of the famous hitch-hiker gag and more of the atmosphere built by the last two scenes, with Leota Thomas chanting "Hurry Back!" and Thurl Ravenscroft & company's haunted refrain of "Grim Grinning Ghosts". One of the trickiest things to do is to get the atmosphere of a dark interior space to spill out into the harsh Florida sunlight, and one of the best ever was Country Bear Jamboree and the Mile Long Bar. 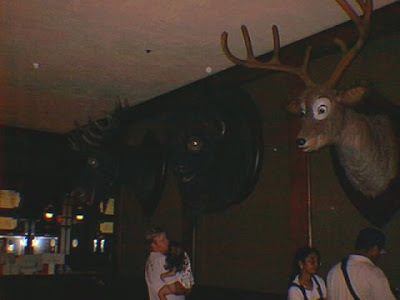 Visitors who saw the show prior to 1998 will probably remember that the original Country Bears exit area spilled out into the Bar, where additional Melvin, Buff and Max audio-animatronics were hung. They would continue to sing and tell jokes, and when I was young, this was literally the only thing I remembered about the attraction. 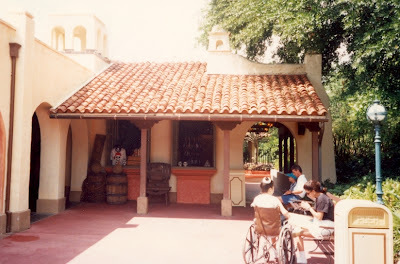 As a punchline and a delightful surprise, as well as one of the most unique attraction extensions ever devised, this went the way of the Dodo in 1998 along with the Mile Long Bar and much of the character of the far Western end of Frontierland. 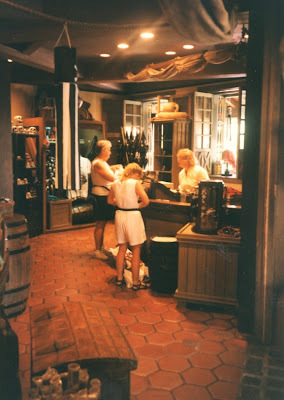 Originally, Caribbean Plaza was full of beautiful niches and side rooms of intrigue and beauty and House of Treasure, a kind of conceptual extension of the ride's treasure vault final show scene, was the place where every kid knew the real good stuff was kept. That was the place to go for your rifles and ships in bottles and attraction branded t-shirts, and the sombreros and carved cocoanuts could be left outside in the open marketplace to rot. I still remember that vaulted ceiling and those stashes of treasure above the shelves. As one of Magic Kingdom's most beautiful and characteristic shops, its' current status as a stock room is pretty sad (if not surprising). Also known as the Keel Boat Hat Shoppe, this little souvenir niche outside the Haunted Mansion was incredibly lame, but at least enjoyably dank and the only place for the generic gothic brick-a-brak that used to be sold outside the Haunted Mansion prior to the advent of Madame Leota's cart. Featured items were gargoyle reproductions, candles, foam rocks, invisible dog leashes, and one (singular) Haunted Mansion t-shirt. I don't really miss this, but the dark interior on certain late afternoons is, for me, as potent a memory as really important MIA park elements like the Skyway. Back before places like TGI Friday's filled every suburban shopping center (or even most of them) and it wasn't too easy to go out and get a full rack of ribs, french fries and a subpar baked potato, this place was awesome. Although the food was blah at best, I was obsessed with the atmosphere of being in a building where a catastrophic explosion has taken place - and the antique firecrackers hanging everywhere didn't make you feel too much safer that it wouldn't happen again. It eventually became a lame Western nightclub and is now an even lamer youth-oriented top 40 place. 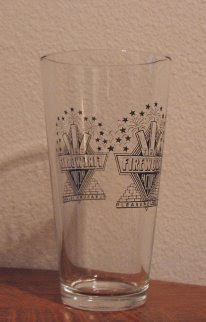 Pictured is the glass I bought from the product display case in 1996; it came filled with cinnamon candy "fireballs". There are other, and in fact better things I miss more (now that a year has passed I'd like to assert, for example, how lame it was for them to have removed the parrot from in front of Pirates of the Caribbean), but these four minor establishments still hold a warm place in my heart. Well, a few of us can rest easy now! When I posted Park Mystery #2, I had no idea that anybody would even care about my interest in windows, let alone that it would cause certain podcast hosts to investigate said area, let alone get several responses that started to lead me down the right path! So suffice to say I was quite thrilled, happily investigating the existence of a photo drop off location there, until I hit a dead end. 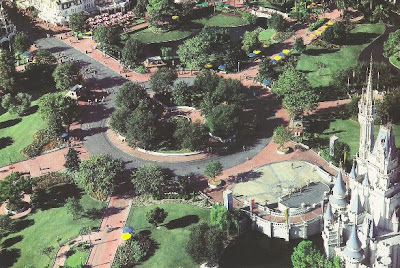 Maps of the Magic Kingdom from the late 80's do indeed show a photo dropoff location there, but the icon is placed in such a way that it could also be referring to The Crow's Nest, which has always been a Kodak location, and is less than fifteen feet away from the windows. So, I was stuck. The Crow's Nest was built sometime in the late 80's, so if I could pinpoint the opening of that building, then crosscheck a guidemap which predates that building's existence and find the same photo dropoff icon, then that's proof that the windows were for photo dropoff, right? Well, thankfully I had made some inquiries and ultimatley ended up saving myself a lot of time. "Your question about the Lafitte's Portrait Deck windows is great, and made me want to give you the most comprehensive answer possible. At some point, however, I have to decide how many days or weeks I should wait before responding... So here's a kind-of answer: My brother worked at LPD and was also able to corroborate my recollections of the Caribbean Arcade. The windows - at least the part that made them real i.e., holes in the wall - were added when the arcade closed down and was converted to the photo operation in 1980. Prior to that I believe there were false windows on the exterior, similar to those lining the wall between the Pirates exit doors and the restrooms to the west. The Caribbean Arcade / Caverna de los Piratas had no windows. Commercial transactions within LPD took place at a south-facing register, not at the windows themselves which were there primarily to display sample photos and raise awareness as to what was inside. 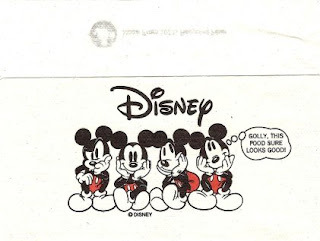 Ice cream was not sold there, nor was LPD a drop-off point for film processing or even Mickey's Film Express service." And shortly thereafter, photos arrived, taken in the mid-90's. Of course now that I have a visual prompt I can remember that shop interior and exterior propping, and feel slightly foolish, but then what are blogs for if not to make the author feel foolish? In all seriousness I'm very happy to finally have an answer to something which has literally been bothering me for years, so cheers to Mike and send roses to Widen Your World. Much of the history and devolpment of The Magic Kingdom is still unknown, not in broader strokes but in smaller ones, and pending a big new WDI authorized book on the park like a triple-thickness Jason Surrell book like his excellent Mansion and Pirates entries, committing as much of this sort of information to the public sphere is about as valuable a persuit as I think I can spend my time on. So I feel rather accomplished today. Having gleaned this information, I began asking around about the Portrait Deck, and eventually spoke to a Cast Member who worked there when it was a break room. He revealed to me that around 2003, WDI planned to turn the location into a photo area with Captain Hook and Smee, and relatively cost effectively, as the old Portrait Deck backdrop did (and supposedly still does) exist. However, the company that was hired to remove the still-existent deck and wheel accidentally tore down most of what was meant to stay (colorblind tractor drivers, anyone?) and the money to rebuild never materialized henceforth. Thanks also to Alison of Walt Dated World, who helped me in my initial research into The Crow's Nest. Over the last few days I’ve been finding my brain doing circles around Mr. Toad’s Wild Ride, over and over again. Of course, I rode it when I was young and was utterly terrified and fascinated all at once at this totally irrational flow of images which was, along with Orlando’s Snow White’s Adventures pre its’ 1993 incarnation, probably one of the most brilliant and subversive things ever to rattle along on an electric drive track through “crash doors” ever put into operation by Disney. The only attraction in history to entice riders with the prospect of donning the persona of a crazed amphibian, Mr. Toad’s Wild Ride is a true anormality. Of the original 1955 “Fantasyland Three” dark rides, Mr. Toad has only been constructed twice – half the number of incarnations Peter Pan’s Flight and Snow White’s Adventures have received. And overall, it is not too surprising – while Snow and Pan told something like their original stories, Mr. Toad spun off on a weird alternate reality that relied on your familiarity with a not-heavily-publicized postwar short feature to even understand the basic elements of what was going on. All that being said, it’s then not too surprising that Orlando eventually declared open season on Toads in 1998. But round and round my brain goes - I guess possibly because we’re staring in the face of ten long years without Toad - as to why the attraction was so brilliant and how accidental it all seemed. I have a distant memory of the original Snow White, a much stronger memory of 20,000 Leagues, but Toad stayed the longest and is the most vivid. When I first sat down to try and write about attraction design several years ago, it was Toad I gravitated towards first – I had to pay tribute first to him and not, ironically, to The Haunted Mansion or Dreamflight, the two attractions which most monopolize my collective unconscious and the two which I am still paralyzed to write about. But Toad? Perhaps because of the simplicity, the directness, the unpretentiousness or Toad, it has always seemed to me to be one of WED’s most accessible 1971 masterpieces. 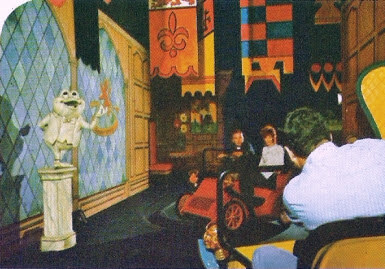 Toad was always the most basic of the Fantasyland dark rides, even in 1955. While a number of characters appeared “in the round” at Snow White and Peter Pan, Toad featured entirely two dimensional characters. Depth in the sets was achieved through basic forced perspective and the spacing out of cut-out painted flats. Characters were often animated using the most basic methods, and there were not too many. What Toad depended on to be effective was the speed of the car, the twistiness of the track, and some basic simple effects like placing rubber lifters in the path of the car to simulate an uneven surface. This is still what makes Toad work today. Of course, the attraction’s piece de resistance was its’ sinister and utterly absurd climax. Anybody of an impressionable age who has raced down that dark tunnel towards the oncoming “train” will never forget the terror of that scene, nor the surprise following when the cars deposited you in Hell to be accosted by rubber demons. This concept seems to account for much of the reason a dark ride was even attempted of Mr. Toad to begin with. 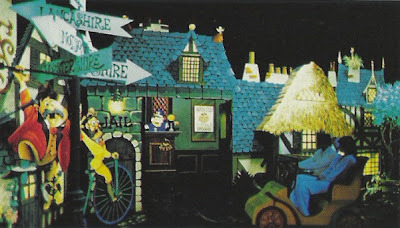 Certainly, the companion piece to the Mr. Toad segment of The Adventures of Ichabod and Mr. Toad – Ichabod Crane’s intense and haunted journey home from the Van Tassel party – is much more suited to dark ride treatment than what was actually built, as the Ichabod Crane chapter is actually built around a pursuit through a darkened environment. It is said that Walt Disney wanted a scary attraction, a funny attraction, and a beautiful attraction for Fantasyland, but even within these parameters, Mr. Toad doesn’t necessarily seem an obvious choice. Alice in Wonderland, in particular, with the film’s production design of multicolored hues in stark contrast within black space, is the literal embodiment of the blacklit dark ride concept. Although Alice involves a certain degree of unease mixed in with its humor, it’s worth noting here that the final Mr. Toad attraction is much darker and more unsettling than its filmic version. Perhaps the error was noticed and rectified in 1958, when Disneyland’s Alice in Wonderland attraction did finally open. Is it possible that humans are simply hardwired in a way which, inevitably, certain tactile experiences are lasting because they’re essentially, innately appealing? Although much of the brilliance of Country Bears and America Sings, for example, is in their structure, they work because they are innovative variations on the time honored tradition of the proscenium arch. So, apparently, sitting still and moving your head from side to side to an effort to keep up with a show is innately appealing to the primordial ooze which we crawled out of. So, apparently, is sitting in a tiny car rattling down a dark rail waiting in mortal terror for the next bend in the track. 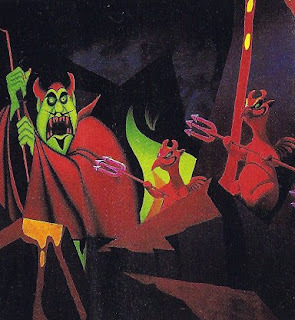 Dark Rides have been popular for well over 100 years now, and possibly because they, moreso than the roller coaster or omnimover or anything else, most recall the dream state and the irrationality of our own collective unconscious. Great dark rides feel like the whole thing is totally out of control. Is this why Mr. Toad works so well? Rather than being themed to riding through a jungle or a haunted house. Toad emphasizes the method of conveyance as the justification for the content, and the irrationality of the twists in the track are not because that’s what dark rides do, but because you’re a totally out of control amphibian riding a hot ticket to Hell. Form dictates content dictates form. And it increasingly seems like any way you cut it, Orlando Toad was a masterwork of a dark ride. One example: while Toad Hall existed as only a few turns of the track in California, the Orlando version spread the setting out to its full potential. The two ride vehicles passed one another, headed off in apparently different directions, turned to almost collide, then shot off to their unique show sequences in the first room. While the left track very sensibly brought riders into a Trophy Room and Kitchen, the right track proceeded utterly illogically through the fireplace. It was the first of a seemingly endless number of utterly terrifying logical fallacies the attraction assaulted the riders with, who were always unsure if they’d push directly through an obstacle or simply “bounce” off it. Original Toad only tried this technique once – exiting Toad Hall – yet Orlando used it as the primary structuring element of the entire attraction. Is this why the ride has stayed with so many so long? We all remember being young, turning that false wheel in a panic trying not to hit the library desk, the cow, and my god the suit of armor. Mr. Toad’s Wild Ride was the nearest to a totally irrational nightmare most young children got to experience in waking life, because the attraction offered a system of control – that wheel – which was utterly useless because no matter how much you turned it, the car would do exactly the opposite of what any sane person would want it to. This reached its’ apotheosis in the absurd but horrifying climax, where we were powerless to not go into the train tunnel and be killed. For all of the threats and shocks of Snow White, Toad was a masterclass in fatalism – I do not want to self destruct, but I have no choice. And remembered it is, on Walt Disney World websites, on You Tube, and pretty much anywhere you can swing a cat you can probably hit somebody who is still embittered over “Toadgate”. I don’t need to repeat the story of “Toadgate” here, as it is recounted better and in detail elsewhere, but suffice to say it still casts a pallor over Orlando’s Magic Kingdom. In a way, it may be appropriate that only the original remains. Disneyland, with its handsome 1983 update of Fantasyland, is far more friendly to the kind of strange, old fashioned attraction Toad represents. The Magic Kingdom, in its’ rush to accommodate more well known popular characters into the park on a regular basis, often throws its’ own unique attractions under the truck in the process. Mr. Toad, hopelessly outwitted by his own comparative obscurity among the Fantasyland elite, eventually did ride his car to glory in 1998. Yet how could Toad have been expected to stand up against his competitors when the attraction his popularity was supposed to save was his only survival in American popular culture? Splash Mountain has not been closed because riders do not recognize B’rer Rabbit, B’rer Fox and B’rer Bear. Perhaps in retrospect it was the sudden closing of the adjacent 20,000 Leagues Under the Sea, with absolutely no fanfare, that ultimately caused all the ruckus with the Magic Kingdom Toad. One day the subs were plowing the lagoon, next they simply stopped, cargo nets were strung over the entrance to the caves, and the water was shut off. These people who grew up riding Toad weren’t going to let this classic slip away without a fight. What is most sad is that there’s no reason Pooh couldn’t have been built elsewhere. 20,000 Leagues had been shuttered for four years by then, and Disney was widely circulating statements that it was impossible to dismantle the lagoon due to the amount of water that would pour into the tunnels underneath. Yet in 2004 the lagoon was drained and dismantled with no problems whatsoever. This could have occurred in the years between 20,000 Leagues’ closure and Toad’s closure, Pooh could have been built on the former lagoon site, and probably would have been a better attraction for it. Disney may have invested some money, but they would have saved themselves a public relations nightmare and gotten themselves a better show in the long run. But they didn’t, and through several accounts I’ve learned that as soon as that last car rattled out of Hell they already were tearing down plywood walls and figures and, by morning, the attraction had been stripped down to the wall studs. It took them only a few hours to destroy something brilliant. I’m sure it didn’t take RKO more than ten minutes to burn the negative to Magnificent Ambersons, either. And what does WDI say to all of this? Take a close look at Walt Disney World’s pet cemetery. There’s Mr. Toad! What does the gravestone say? Here’s God’s Honest Truth, people.